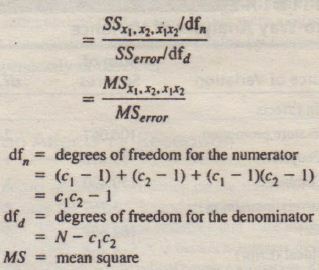 We illustrate one-way ANOVA first with an example showing calculations done by hand and then using computer analysis. Suppose that only one factor, namely in-store promotion, was manipulated, that is, let us ignore couponing for the purpose of this illustration. 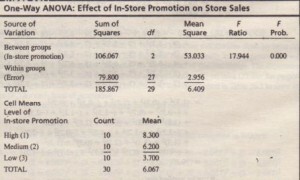 The department store is attempting to determine the effect of in-store promotion (X) on sales (Y). For the purpose of illustrating hand calculations, the data of Table 16.2 are transformed in Table 16.3 to show the store (Y v> for each level of promotion. 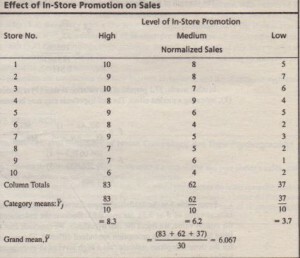 In other words, 57.1 percent of the variation in sales (Y) is accounted for by in-store promotion (X), indicating a modest effect. The null hypothesis may now be tested. From Table 5 in the Statistical Appendix, we see that for 2 and 27 degrees of freedom, the critical value of F is 3.35 for a = 0.05, Because the calculated value of F is greater than the critical value, we reject the null hypothesis. We conclude that the population means for the three levels of in-store promotion are indeed different. The relative magnitudes of the means for the three categories indicate that a high level of in-store promotion leads to significantly higher sales. Table 5 in the Statistical Appendix that the critical value of F for 2 and 27 degrees of freedom is 3.35. Because the calculated value of F (17.944) is larger than the critical value, the null hypothesis is rejected. 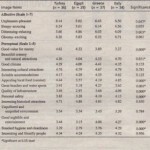 As can be seen from Table 16.4, the sample means, with values of 8.3, 6.2, and 3.7, are quite different. Stores with a high level of in-store promotion have the highest average sales (8.3) and stores with a low level of in-store promotion have the lowest average sales (3.7). Stores with a medium level of in-store promotion have an intermediate level of average sales (6.2). These findings seem plausible. Instead of 30 stores, if this were a large and representative sample, the implications would be that management seeking to increase sales should emphasize in-store promotion. The procedure for conducting one-way analysis of variance and the illustrative application help us understand the assumptions involved. The salient assumptions in analysis of variance can be summarized as follows. 1. 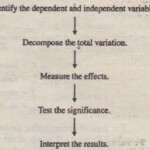 Ordinarily, the categories of the independent variable are assumed to be fixed. Inferences are made only to the specific categories considered. This is referred to as the fixed-effects model, Other models are also available. In the random-effects model, the categories or treatments are considered to be random samples from a universe of treatments. Inferences are made to other categories not examined in the analysis. A mixed-effects model results if some treatments are considered fixed and others random. 2. The error term is normally distributed with a zero mean and a constant variance. The error is not related to any of the categories of X. Modest departures from these assumptions do not seriously affect the validity of the analysis. Furthermore, the data can be transformed to satisfy the assumption of normality or equal variances. 3. The error terms are uncorrected. If the error terms are correlated (i.e., the observations are not independent), the F ratio can be seriously distorted. In many data analysis situations, these assumptions are reasonably met. Analysis of variance is therefore a common procedure, as illustrated by the following example. A survey was conducted to examine differences in perceptions of ethical issues.The data were obtained from 31 managers, 21 faculty, 97 undergraduate business students. and 48 MBA students. As part of the survey, respondents were required to rate five ethical items on a scale of 1 = strongly agree and 5 = strongly disagree with 3 representing a neutral response. The means for each group are shown. 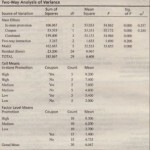 One-way analysis of variance was conducted to examine the significance of differences between groups for each survey item, and the F and P values obtained are also shown. The findings indicating significant differences on three of the five ethics items point to the need for more communication among the four groups so as to better align perceptions of ethical issues-in management education. • How do the consumers’ intentions to buy a brand vary with different levels of price and different levels of distribution? • How do advertising levels (high, medium, and low) interact with price levels (high, medium, and low) to influence a brand’s sales? • Do educational levels (less than high school, high school graduate, some college, and college graduate) and age (less than 35, 35-55, more than 55) affect consumption of a brand? • What is the effect of consumers’ familiarity with a department store (high, medium,and low) and store image (positive, neutral, and negative) on preference for the store? A larger effect of X1 will be reflected in a greater mean difference in the levels of XI and a larger SSx,. The same is true for the effect of X2. The larger the interaction between X1 andX2, the larger SSx, X2 will be. On the other hand, if X1 and X2 are independent, the value of SSx, X1 will be close to zero.? The foregoing analysis assumes that the design was orthogonal, or balanced (the number of cases in each cell was the same). If the cell size varies, the analysis becomes more complex.